Coat your paint in a durable 9H super-coating! Britemax Igneous Quartz Ceramic Coating is a clear, nano crystalline coating that will protect your vehicle from UV rays, harsh weather conditions, chemicals and more while also repelling water, dirt, and other unsightly contaminants. Britemax Igneous Quartz Ceramic Coating delivers an outstanding level of gloss and sleekness, while also providing superior protective abilities. Safe for use on clear coats, gel coats, plastics, vinyl, rubber, metal, chrome, and glass, Britemax Igneous Quartz Ceramic Coating is a one-stop protection and shine-inducing vehicle coating! In an industry now full of different paint coatings, Britemax has strived to stand out by making their newest paint coatings more durable and hydrophobic than many of their competitors. Featuring a 9H hardness rating, Britemax Igneous Quartz Ceramic Coating is approximately 2-3 micron thick and will protect against many exterior assaults. While proper maintenance is still required, Britemax Igneous Quartz Ceramic Coating almost makes your vehicle “scratch-proof”! Britemax Igneous Quartz Ceramic Coating is extremely hydrophobic and makes for a great “self-cleaning” layer of protection. Rather than sitting on the surface and drying to form water spots, water simply rolls right off of the slick surface. The high surface tension also creates that famed beading reaction, which is also the mark of a high-quality paint coating. Creating a long lasting gloss, as well as an anti-corrosion layer of protection, Britemax Igneous Quartz Ceramic Coating is an ultimate in paint coatings and will delivery exception results after just one application! 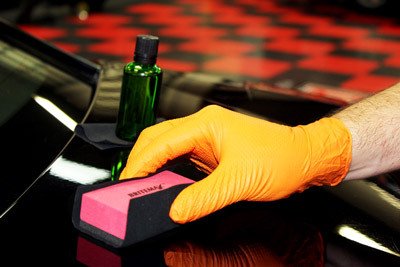 Britemax Igneous Quartz Ceramic Coating comes with a foam coating applicator block and 5 microfiber suede towels. For the best results of Britmeax Igenous Quartz Ceramic Coating, fully wash and decontaminate your vehicle before application. If necessary, remove swirls and scratches. If paint imperfections are not severe, you can prep the surface using Britemax Virtue Si02 to remove light swirls and scratches and get the surface ready for coating. Apply a few beads of product onto the suede microfiber towel wrapped applicator and apply in straight lines with a 50% overlap onto areas approximately 3×3 sq. ft. or less at a time. Allow coating to flash (approximately 2-4 minutes) before using a clean and soft microfiber towel to buff away. If applying an additional layer, wait 1 hour between coatings. Do not let the treated surface get wet for 12-24 hours to allow for proper curing. To maintain Britemax Igenous Quartz Ceramic Coating, use Britemax Remax Si02 Hydrophobic Spray Sealant.